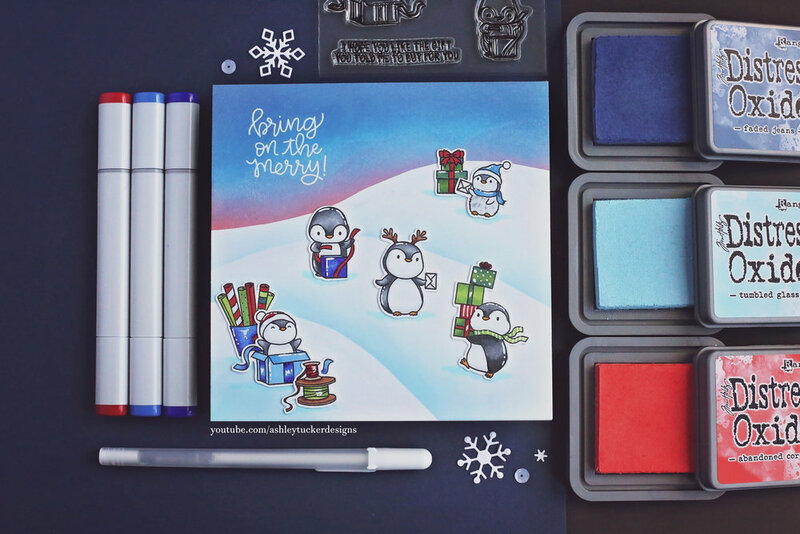 For today’s card I created a winter scene using the Cool Penguins stamp set by Mama Elephant. I started out by stamping all of the images from the Cool Penguins stamp set onto some Neenah Solar White card stock. I stamped them with my MISTI tool using Gina K Amalgam ink. Next I colored in the images with Copics. Check out the video for all of the coloring details! Once the coloring was done I cut the images all out with my Scan N Cut. To create the background I started with a piece of 6 x 6 Bristol Smooth paper. I cut some curvy lines across a coupon pieces of masking paper to create the hills in my scene. I placed the first mask and blended my sky. I used Distress Oxide inks to do all of the blending. For the sky I used the colors Abandoned Coral, Tumbled Glass, Salty Ocean, and Faded Jeans. Once the sky was done I pulled up the mask and then laid down a second mask further down the page. I blended a light amount of tumbled glass just about the mask to create the shadows on my snow. I repeated this one more time so that in the end I have three snowy hills. When the Distress Ink was dry I prepped it with my powder tool for some embossing. I stamped a sentiment from Mama Elephants Scripty Xmas stamp set with Versamark ink on the sky. The sentiment says “bring on the merry!” I embossed it with a white embossing powder. Next I used Gina K Connect glue to glue down all of my colored in images on the scene. To finish up this card I added some highlights and details to the images with my white gel pen. I also used a light blue Copic marker to add drop shadows under everything. Finally the last thing that I did was use my Wink of Stella glitter brush to add some sparkle to my snow.